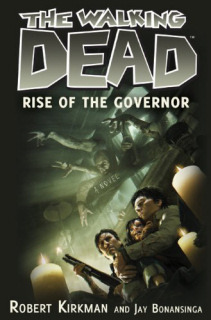 Pre-Order The First Walking Dead Novel, “Walking Dead: Rise of the Governor”!!!! Robert Kirkman (author of Walking Dead) is quite busy these days with all of his comics and the excellent Walking Dead tv show on AMC. He dedicated some of his time to the first novel for his hit Zombie series “The Walking Dead”. This looks like it will be a prequel of sorts on how that character of the Governor rose up in power and became who we all know who he became to be. In The Walking Dead universe, there is no greater villain than The Governor. The despot who runs the walled-off town of Woodbury, he has his own sick sense of justice: whether it’s forcing prisoners to battle zombies in an arena for the townspeople’s amusement, or chopping off the appendages of those who cross him. The Governor was voted “Villain of the Year” byWizard Magazine the year he debuted, and his story arc was the most controversial arc in the history of The Walking Dead comic book series. Now, for the first time, fans of The Walking Dead will discover how The Governor became the man he is, and what drove him to such extremes. The book will be 320 pages and will be released September 27th of this year. Please pre-order with us by clicking below!!! ‘The Walking Dead’ Season 4 Recap – Episode 11 ‘Claimed’!! This entry was posted on Wednesday, April 27th, 2011 at 3:36 pm	and is filed under Comics, News. You can follow any responses to this entry through the RSS 2.0 feed. You can skip to the end and leave a response. Pinging is currently not allowed. « Aqua Teen Hunger Force Is Done!!! Make Room For Aqua Patrol Unit Squad 1!! !